I simply cannot understand the fascination for focus groups. Very rarely does anything good come out of it. 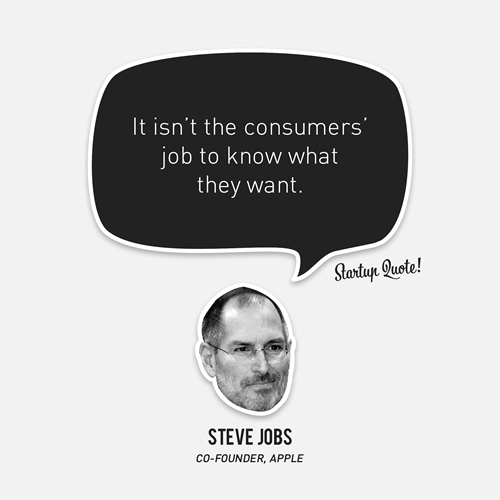 If focus groups were all it is portrayed to be why are there so many duds in terms of products, ideas and campaigns? Why do we ignore the collective wisdom that the marketing and agency teams bring to the table? Why do we overlook the wealth of knowledge waiting to be tapped from the war zone like sales, customer care etc? Why do we discount commonsense? And can respondents really be trusted? I am not alone with my rant. There are many in the business with much stronger concerns about focus groups. I liked this example (via) that just hits the spot. Years ago, British Airways (BA) decided to introduce a new service for its first class passengers on long haul flights. It was basically a mini fridge full of goodies so that if you woke up in the middle of the night feeling a little hungry, you could get something nice for yourself. The question was: What do we put into this little fridge? BA dutifully did its market research and assembled several focus groups of first and business class passengers. What would you like, they asked? The response was universal. People wanted fruit or perhaps some light salads. All very good. All very healthy. And they did put some chocolate and cakes in and when they checked at the end of the flight, they were all gone and nobody had touched the apples or salads. Pixar is what every creative organisation should aspire to become. Not only are their films critically acclaimed but are also mega-commercial successes. In the interview above you get to know the reason why. It is all about leadership and culture. This simple interview covers lot of territory and is at once fascinating and insightful. For example, take managing ‘creative types’. In an agency you can see some of the so-called-creative types strutting about like a peacock-on-heat throwing tantrums and in general making life miserable for everyone. Management is completely paralyzed into inaction not knowing how to deal with them. The result is that such behaviour becomes cancerous vitiating the entire atmosphere. At Pixar, the creative process is viewed as a group effort. While there is room for creative eccentricities, they do not let it affect group dynamics. They simply fire the creative person even though he might be the best. Following is the transcript about that from the interview. "[At Pixar] there is very high tolerance for eccentricity, very creative, and to the point where some are strange… but there are a small number of people who are socially dysfunctional [and] very creative – we get rid of them. If we don’t have a healthy group then it isn’t going to work. There is this illusion that this person is creative and has all this stuff, well the fact is there are literally thousands of ideas involved in putting something like this together. And the notion of ideas as this singular thing is a fundamental flaw. There are so many ideas that what you need is that group behaving creatively. And the person with the vision I think is unique, there are very few people who have that vision.. but if they are not drawing the best out of people then they will fail. We will support the leader for as long and as hard as we can, but the thing we can not overcome is if they have lost the crew. It’s when the crew says we are not following that person. We say we are director led, which implies they make all the final decisions, [but] what it means to us is the director has to lead.. and the way we can tell when they are not leading is if people say ‘we are not following’." Do you think an agency will dare to do this? 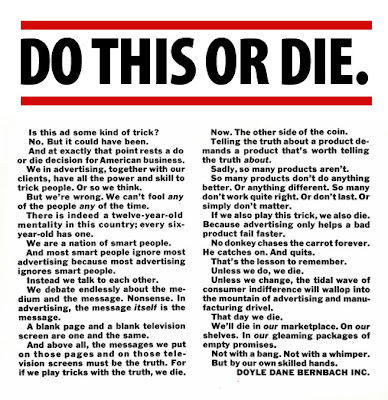 This message is as relevant today as it was when Bill Bernbach wrote it decades ago. Marketing and communication(creative) without lies and hypocrisy can work magic. Bill Bernbach has proven it many a time. And so have quite a few like him. Therefore, what is stopping you?